The step as proposed in this guide is of 30 kilometres. This may result excessive for some pilgrims, but they always have the opportunity to stay the night in Bercianos, thus, converting the day into a hike of 20 kilometres. The are two reasons why walkers are encouraged to stop in El Burgo Ranero, firstly, this town is better prepared to meet the needs of walkers, and secondly the majority of the route is on flat ground. The Camino of Santiago abandons the province of Palencia to enter Leon. Before reaching Sahagun, about ten kilometres from the exit, there are a couple of small villages offering the possibility to purchase supplies. Sahagún, for cultural reason and its historical heritage, is a must. Halfway between this town and the end of stage it is possible to replenish supplies in Bercianos del Real Camino. Be careful on very hot days because even generous provisions may come to nothing. There is another variant route that ends in Calzadilla de los Hermanillos that re-connects to the original path the next day. Since the departure from Terradillos de los Templarios the route has stayed very close to the tarmac of P-905. Cereal fields and the sound of two streams will accompany the pilgrims to Moratinos. It has a hostel and a bar-restaurant. The Church of Santo Thomas de Aquino, a monument built in the XVI century and completed in the XVII century guards, inside a curious image of a Virgin with a child in her arms. The route approaches the province of León, but before arriving enters San Nicolás del Real Camino, The last village in Palencia, which, in addition to being very quiet, has an albergue, a bar and the restaurant Casa Barrunta. In the direction Sahagun, a track parallel to the N-120 is taken and is not departed from until approaching this historic town of Leon. Before arriving walkers will pass the chapel Virgen del Puente, a curious hexagon-shaped temple. 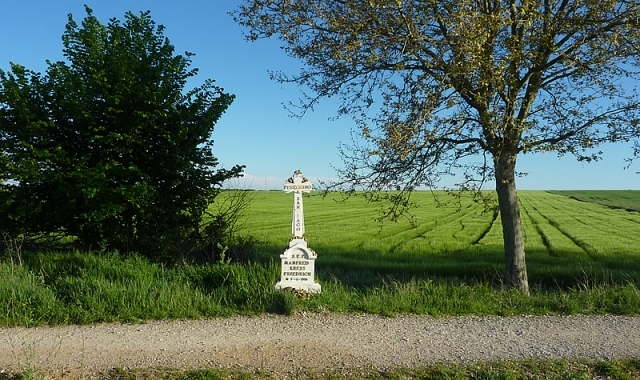 Some pilgrims never see this monument, preferring to continue straight ahead to Sahagun. At the exit of this illustrious town the path parallel to the N-120 is taken again and becomes worse as it narrows and moves closer to the Camino. This route is not abandoned until the end of the stage. It is important to exercise caution at a fork in the road, located four kilometres from here. 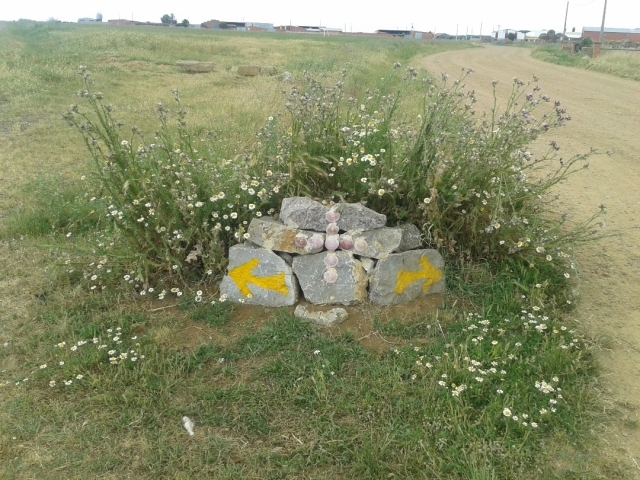 The signposts may be misleading and every week at least one pilgrim ends up in Calzadilla de los Hermanillos by taking the old Traiana road only to pay for the mistake the next day. The Original Route bypasses this town. The pilgrims should visit Bercianos, after passing the shrine of Our Lady of Perales. At the entrance of the village there is a fountain for hikers. Two albergues, an alternative accommodation, a bar and a grocery shop, the two options offered by the town to replenish energy and before continuing until the end of the stage. A seating area is the only distraction until arriving to El Burgo Ranero, still 7 kilometres away. Cyclists can enjoy a peaceful day and the kilometres are covered quickly due to the almost completely flat terrain. Those who want to avoid the gravel on some sections of the Camino can go around on the asphalt of the N-120, with good visibility and little traffic. He aquí la mentada bifurcación: una va para Bercianos, la otra para Calzadilla... ¡atención! Ahhhh gracias ya me estaba complicando antes de tiempo !!!! Las dos son correctas, mabel. Hacia la derecha vas a Bercianos (nosotros fuimos allí y nos hospedamos en el Albergue Santa Clara) y para la izquierda te diriges a Calzadilla de los Hermanillos. Ambas variantes se unen cerca de El Burgo Ranero. 1 reviews Distance to Santiago: 379 km. 1 reviews Distance to Santiago: 366 km. 1 reviews Distance to Santiago: 350 km. 1 reviews Distance to Santiago: 376 km. 1 reviews Distance to Santiago: 373 km. 1 reviews Distance to Santiago: 354 km.